There are many different regional requirements, specifically accumulator capacity and pump output flow rates, which make sizing a BOP Closing Unit a difficult task. 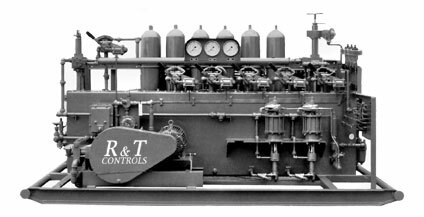 R&T Controls technical staff are ready and able to assist you in specifying the optimum and most cost effective equipment configuration for your application. PLEASE CONTACT US. A 20 40 2 1 3 1/2" 1/2"
B 40 90 4 1 4 1/2" or 1" 1/2" or 1"
C 60-80 125 6-8 2 4 1" 1" or 1-1/2"
D 80-140 210 8-14 2 6 1" 1" or 1-1/2"
E 140-200 280 14-20 2-4 8 ** 1" 1" or 1-1/2"
F 200-240 350 20-24 2-4 10 ** 1" 1" or 1-1/2"
G 240-300 420 24-30 4 12 ** 1" 1" or 1-1/2"